The Pound pushes slightly higher after being supported by a weaker US Dollar. The US Dollar started to weaken on Friday following dovish and cautious comments from Fed's Powell. Powell stated that there is no preset path for policy which signaled flexibility from the Fed's side. In support of the Fed's flexibility claim, Powell also mentioned that the US central bank has "a history of altering policy actions according to conditions and is always prepared to shift the stance of policy". Traders need to note that Powell's dovish comments outweighed the stronger than expected NFP results which explains why the greenback ended Friday on a low note. For today, investors will continue digesting Powell's Friday comments and also keep an eye on any news coming out of the ongoing trade negotiations between US and China. Additionally, investors will also keep an eye on any significant development related to Brexit. 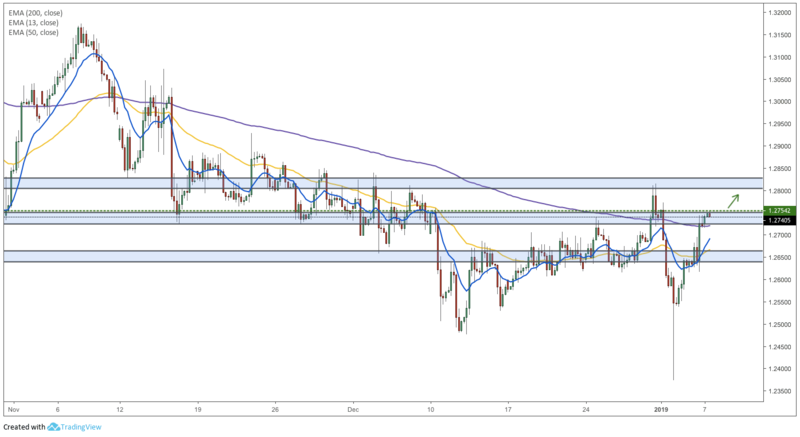 Following a weakening US Dollar, the Pound manages to break above all the three major moving averages and rise towards the 1.2754 resistance level. The break above the three major moving averages signals strong bullish momentum. Going forward, the next leg upwards will only be confirmed if prices break above the 1.2754 resistance, paving the way for a rise towards 1.2795. The flip scenario will be that prices break below the 200-period moving average (purple) paving the way for a drop back towards the 1.2671 support level.